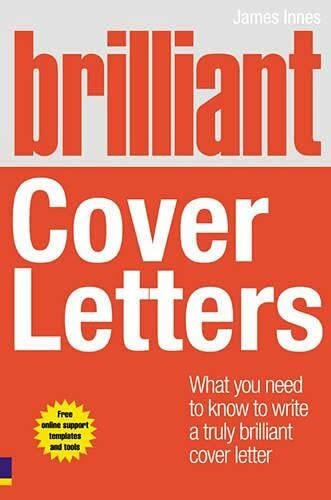 Brilliant Cover Letters is the definitive book on cover letters, authored by James Innes, the Founder and Managing Director of The CV Centre the UK's leading CV consultancy responsible for writing many tens of thousands of cover letters annually. The advice given is tried, tested and proven on a daily basis within The CV Centre. Brilliant Cover Letter includes free bonuses such as cover letter templates available for download and immediate use and suitable for pretty much all purposes, from graduates to executives, and including templates for 'special cases', e.g. legal, medical, IT, teaching, etc. There's also a special offer for The CV Centre's services. A key feature of the book nothing quite like it exists in competing titles is a chapter covering the 15 most common cover letter mistakes and how to avoid them (based on extensive statistical analysis The CV Centre has undertaken of many thousands of cover letters). Only a tiny percentage of cover letters manage to avoid all these mistakes and most are victim to several. Avoiding these mistakes makes all the difference to whether your application ends up in the 'yes' pile or the 'no' pile also known as the bin! Make your cover letter stand out from the rest. The competition is tougher than ever. With so many qualified and experienced candidates out there, how do you make sure your cover letter makes an outstanding impression? Based on years of experience writing and reviewing successful cover letters, recruitment expert James Innes guides you through the essential rules for writing brilliant cover letters. Discover the 15 most common cover letter mistakes – and how to avoid them – and the top five things you can do to guarantee your cover letter is seen by the right people. Brilliant Cover Letters has full, free online support – cover letter templates, tools and reader offers – all available through The CV Centre online. James Innes is the Founder and Managing Director of The CV Centre – the UK’s leading CV consultancy. Following more than a decade of experience heading up The CV Centre, James is widely considered to be one of the UK’s leading careers experts. James regularly participates at recruitment fairs and conferences as a sought-after guest speaker, as well as being interviewed on TV and radio.